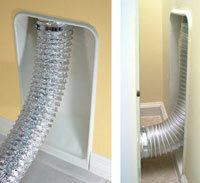 Reduce Dryer Fire Hazard - prevent crushed hose which creates lint build up that can start fires. It is surprisingly common to find problems with the transition hose behind the dryer. Odds are that the view behind your dryer closely resembles one of the pictures to the left. 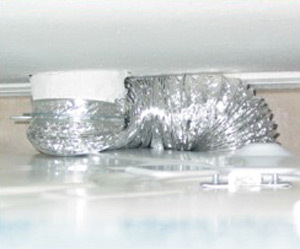 Just like every other home across the United States with a laundry room that is not in the basement, the standard practice of running the exhaust pipe is to penetrate the drywall with a 90-degree elbow is very common. It's been this way for many years and has likewise been the accepted practice. This obviously becomes a serious fire safety issue. Lint accumulation and reduced exhaust airflow feed on each other to provide conditions ripe for a fire. Lint is highly combustible and decreased airflow causes overheating of the exhaust environment, demanding excessive cycling of the high temperature limit switch and eventual failure. If your clothes are taking longer to dry or if the velocity of air exhausting from the dryer vent hood is minimal, maintenance is needed. Clothes dryers are prone to lint build up if there are numerous 90's in the system or the distance is excessive. Therefore, the exhaust hood (roof jacks especially), transition hose and metal ducts should be inspected and cleaned on a regular basis. 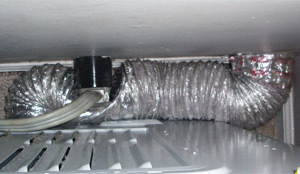 The most preferred material for connecting the dryer to the outlet is the aluminum flexible duct. Installation of the Dryerbox not only makes for a cleaner looking finish that saves space and saves energy. 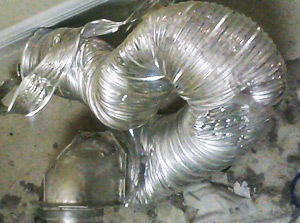 It can also protect against crushed hose which whould, otherwise, create a very real fire danger.